In May, army commander General Prayuth Chan-ocha imposed martial law and seized power from Prime Minister Thanksun Shinawatra. Thailand was in a political crisis. Ongoing protests before the coup wanted the prime minister out, due to charges of corruption and damages to Thai democracy. Yet he also enjoyed strong support in many poorer areas of Thailand, due to his reform of social programs and economic policies. The coup d'état in Thailand is in its second month. The military announced that elections will only take place after October 2015. Members of Thai society are divided over the timeframe that the military has given for the return to democracy, yet even this small concession is unprecedented. On top of which, the junta has promised to set up an interim civilian government within three months and then an assembly to draft a new constitution. All this is set against ongoing social changes brought about by new technology. 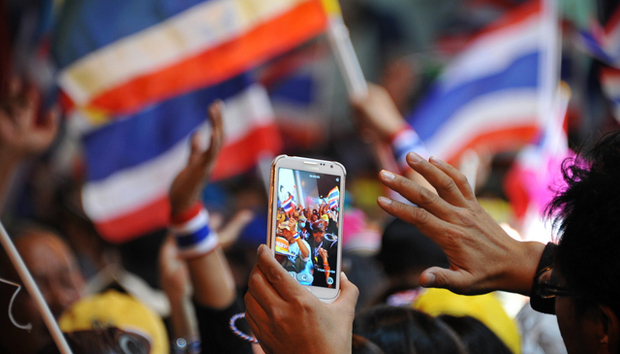 This year the number of mobile subscribers in Thailand exceeded the entire population by one-third. Now the local mobile market stands at 95.5 million, with 25 million 3G customers using the 2100-megahertz network. Yet perhaps even more significantly, Thailand also has the highest percentage of Facebook users. This has had serious social repercussions, because whilst the Thai military has been successful in overthrowing many of its governments in the past, this year, the military junta was faced by the might of social media used by dissenters. The population remains torn over whether it should support the military. Many feel that the alternative might have been a lot worse due to ongoing political conflict that could easily have developed into a violent confrontation. The price for this greater security though, has been democracy. The Thai population has been so passionate about politics that the Thai junta has started to crackdown on freedom of expression. The edicts put in place by the military warn mainstream media and social media users against disseminating any information that could "incite conflict" or "cause problems" among the public. The new orders also require media outlets to broadcast any junta-ordered announcements or information. This month, military authorities detained news magazine editor Thanapol Eawsakul for four days over critical comments he made about military rule on the social networking site Facebook. At least two other journalists have also been temporarily detained and interrogated. "Gen. Prayuth said on his televised program, repeatedly since the coup, to urge those who disagreed with his views to open up their mind and talk, but this announcement says the opposite. The order is very broad and ... every comment is subject exclusively to interpretation whether they violate the order or not." In such an environment the media in Thailand cannot act as a watchdog. The junta wants the media to be on its side and has been very diplomatic in handling things. On the other hand, Thai Journalist Thepchai Yong argues that whilst, “Representatives of the junta phone in once in a while when there are stories that do not please them,” he hasn't seen any obvious attempt to clamp down. However, journalists are clearly operating under uncomfortable circumstances. With the political conflict the influence of social media has increased because young people who ignore mainstream channels go there to share their views. Social media in some ways seems a more reliable medium for the people since there are obvious gags on other outlets. Also, the opportunity to find likeminded people is a blessing during political strife. There is no way that resistance to the military could be organised without the use of social media. The military is struggling to deal with protests in cities that are erupting more like flash mobs than political rallies. Social media platforms such as microblogging site Twitter are instrumental in arranging rally points, sharing police or military positions and letting others know about workarounds should authorities attack. Protesters say they are keeping numbers low and gatherings scattered, to avoid presenting an easy target for any violent response. It’s like peaceful protests using guerilla warfare tactics. The protesters have promised ongoing demonstrations till the coup ends whilst the military has banned political gatherings of more than five people. In fact even small gatherings have been turning into crowds of hundreds in Bangkok after a lengthy and intense stand-off with the military that had huge play on Twitter. Groups have protested in the capital, in the northern city of Chiang Mai and in Khon Khaen in the northeast. In contrast, the military's use of media has remained old fashioned, with an army spokesman reading out statements on TV from a plain desk against a white background. Whilst the junta's National Council for Peace and Command (NCPO) still has no website. In May Thai officials held a meeting to discuss online anti-coup dissent, but there were no social-networking companies in attendance at the meeting. Maj. Gen. Pisit Paoin, adviser to the Ministry of Information and Communication Technology's permanent secretary, told media after the meeting that he had personally phoned representatives from Facebook and Google to invite them. Several Thai internet service providers were on hand, but Google and Facebook declined to comment. There are some things that are beyond the control of traditional power and the territorial sovereignty for the ruling administration. The global technological landscape has evolved dramatically since 2006, when the military launched its previous military intervention. In 2006 the army unseated then-prime minister Thaksin Shinawatra, who was accused of corruption and disloyalty to the country's royal family. Back then, Facebook was only two yeas old and smartphone technology was not yet pervasive. The iPhone had not even been released yet. Today the military’s strategy is for immediate control, and then to manage the fallout when it happens. But when the Thai junta blocks social media activity, users will simply find workarounds. You only have to look elsewhere in the world: a diverse list of countries including China, Turkey, Pakistan, Vietnam, have blocked websites. Yet it does not matter because of the availability and use of proxies along with a wealth of other solutions. The only time it would matter is if providers like Facebook, Google or Instagram themselves decided to take a stand for the curtailment of free speech, and that won’t happen. Now social media is an ideal way to give ordinary people a voice. And blocking websites and creating firewalls just creates resentment for the populace against the rulers.